An upcoming change in consumer demand could render dog walkers more in demand than teachers over the next decade, a new report suggests. 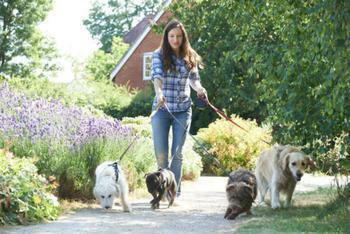 As empty nesting Baby Boomers focus increasing amounts of attention on their pets, pet spending is expected to rise. While the shift in consumer mindset may spell good news for furry family members, some less positive changes may be on the horizon for teachers. A report from the Conference Board finds that the potential student population comprising five- to 24-year-olds will exhibit sluggish growth due to the downsized post-Millennial Generation Z, which could result in a somewhat less fruitful job market for teachers. A "reshuffling of the overall consumer mindset" is coming in the next decade, the report’s co-author Brian Anderson told BloombergMarkets. Amid a changing demographic landscape, consumers may notice a few economic changes. The business membership and research association’s report found that spending on books, newspapers, and other reading materials will increase as growing numbers of retirees look for ways to fill their newfound free time. Retirees are also expected to spend more on home repairs that they would rather not tackle themselves. Health-care expenditures will increase in conjunction with the growing number of Americans between the ages of 70 and 84. Meanwhile, the aging of the overall population will result in smaller increases in spending on goods and services that are popular with younger Americans (namely, restaurant meals and apparel). It's worth noting that the study's projections are based exclusively on demographics; its figures don’t factor in the impact of rising wages and wealth over the next 10 years, Bloomberg pointed out. Thus, the report's projected 8.1% rise in total household expenditures over the next decade may be a modest estimation of the increase that will actually happen. How prepared are you to cover medical expenses in retirement?